You will gain considerable practical experience in reporting and production across print, broadcast and electronic platforms. You will learn first-hand from experienced journalists by participating in ‘live’ projects, visiting local broadcasting organisations and listening to guest speakers. You will have the opportunity to experience a day as a journalist; sourcing stories, interviewing, filming and editing your report as part of our dedicated News Days. Throughout this course you will develop specialist and transferable skills all of which are essential for the wider media profession. You will be introduced to a range of theoretical concepts including representation, and develop skills in the basics of news writing and reporting for newspapers, digital platforms and in broadcasting; and an awareness of legal and institutional frameworks within which journalists operate. You will build upon your news gathering, editing and technical skills. Deeper theoretical understanding is developed around news values and discourses and you are introduced to new practical skills in web design and working on ‘live’ client specific projects. In Year 3 you will continue to develop your specialist knowledge and have three options in Semester 2; a 6 or 12 week placement, an academic semester at one of our partner institutions abroad, or a taught route on-campus offering you flexibility to tailor your own study to your own interests. Your final year will focus on specialist modules including Celebrity Culture and Postmodern Culture. You will work with a supervisor to develop a research project on a topic of your choice which will develop your research, analysis and synthesising skills. The Investigative Journalism assignment is a highly practical project which you will work on individually or as part of a team. You will learn through a range of delivery modes including lectures, tutorials, workshops and practical based activities. The nature of the course is interactive: you’ll apply theory to practice, and consider a range of problems, issues and case studies, including live client projects. Academic modules are typically delivered by a one hour lecture followed by a seminar where you can discuss or apply the thinking to relevant tasks. This may involve analysing texts, role-playing, giving oral presentations. The practical classes will involve sourcing stories, conducting interviews, filming, editing and participating in News Days. Investigative journalism includes input from a range of industry experts. You will work independently on your Research Methods proposal, Research Project and Investigative Journalism pieces. This entails extensive research in terms of reading, data collection, writing and editing. Typically, this will involve the creation of a vlog, radio or TV package and may entail travel to interview participants. Academic staff who teach on this course have worked in a range of professional backgrounds within the creative and cultural industries including journalism, public affairs, publishing, public relations, digital media, media production and business, and have links to the National Council for the Training of Journalists (NCTJ) which ensures our teaching is professionally relevant. Other staff members include industry guest lecturers, staff from Aberdeen Business School and the Law School, honorary doctoral professionals and librarians. In Year 3, you will have the invaluable opportunity of undertaking a six or twelve-week placement where you will be able to put your skills and knowledge to the test in an appropriate journalism or media-based environment, as well as form excellent links with potential future employers. 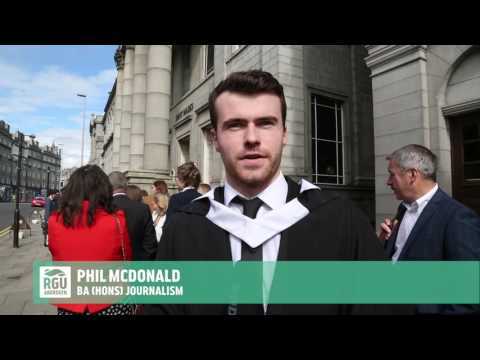 Previous placements have included STV, Northsound, Press Association (Glasgow), Original 106FM, Scottish Field Magazine (Edinburgh) and Evening Express. In Years 2 and 3, there are opportunities to study with partner institutions in Europe or worldwide as part of the Erasmus Programme. This is dependent on similar Journalism programmes being offered by partner institutions. The critical knowledge base and production, managerial and technical professional skills you will acquire throughout the journalism course will open up opportunities in a wide variety of careers in the communication and media industries within and beyond the journalistic profession. Possible careers range from press, radio, television and online as well as public relations and media management. Previous journalism graduates have secured jobs in print, publishing, broadcast and online journalism and now work for organisations including BBC Xtra, The Surrey Advertiser, Original 106, The Press and Journal, Evening Express. Students with degrees in Journalism are also entering Communications, Sales and Marketing roles including Communications Manager at Gatwick Airport. SQA Higher: BBBB to include English. GCE A Level: BCC to include English. Irish Leaving Certificate Higher: H2H2H3H3 to include English at H2. IB Diploma: 28 to include Higher Level English at grade 5. Applicants who are interested in applying for advanced entry will be considered on an individual basis. The course was an excellent way to gain valuable knowledge to work across broadcast, print and digital journalism. The practical aspects are a fantastic chance to strengthen your skills and prepare you for working in the media. The work placement was invaluable in helping me into the industry to start a career in broadcast journalism.